Oh, yeah, right. Monopoly. No, we are not talking about the board game. Our topic is progressive jackpot slot game. Well, we all played this game in our childhood but now it is time for older boys and girls to figure out what is good about this type of slots. If you are going to win, you will need some slots tips about winning slot machines. WMS Gaming is making this game. It is recognized as one of the biggest and famous designers of the slots activities. They decided not to be really original but betted on the well-known game. Actually, over 750 million people tried playing this game at least once. 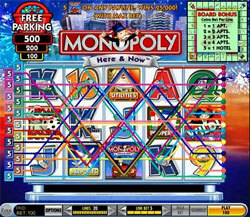 WMS Gaming was awarded several times for this invention of this slot. Of course, they first entered the land-based casinos market but once the online casinos opened their doors, Monopoly was right there. As everyone predicted, it would be as popular online as it was offline. None was wrong. It was launched back in 1999. It was recognized as "Most Innovative Gaming Product" in American Gaming. There were four different versions of the game. Two of them were classic and old-fashioned. Now they are like fossils in the market. Just like any other modern slot game, Monopoly has the features too. The main one offers to roll a dice in order to move around the board. While moving around the board you are gathering properties that gradually turn into a bonus. You can go to jail, which is not a perfect opportunity as the game ends at this point. Also you can get a Pass Go bonus. Once you gather three dice symbols on active line, you start Board Bonus game. Then you choose the dice, which settles the quantity of rolls you are going to make. If you are lucky enough, you can get some property. It means that you are increasing your chances for bigger bonuses. Monopoly slots are available online too. One of the most-known producers is WagerWorks, which also makes Megajackpots.